Fresh off the grill, nothings beats the flavor of a homemade burger. My love of hamburgers is fairly epic. I know all the places in Dallas, and a few in Houston, where juicy grilled beef goodness can be found, and I have an almost endless supply of burger recipes at my disposal. Call it burger for every mood. There is an art to a well balanced hamburger, and so many places get it wrong. Obviously the patty is crucial. It needs to be 100% meat, it needs to be cooked properly so it does not become a dried out hockey puck, and it needs to be in balance with the bread. I hate more than anything those burgers that are more slab of meatloaf that tender burger, and I hate it when the bread is completely obscured by meat. Speaking of bread, freshness is key. I also like it when the bread is toasted because it shows an attention to detail that my fussy heart adores. Finally, toppings should be full-flavored, and added with a judicious hand. I do not want an entire garden salad on my poor little burger. These burgers are among my favorites in the ‘home burger’ category. Why? Bacon!! Yes, these patties are composed of lean (but not ultra lean – think 90/10) grass-fed, pasture raised ground beef, and hardwood smoked, nitrate free and preservative free ground bacon. You will note I an specific about what type of meat and bacon I prefer. If you are going to eat a burger you should use the best possible ingredients, and I am passionate about ingredients. Topping these burgers are the usual suspects: crisp bacon strips, thick sliced pepper jack cheese, mayonnaise (I prefer Dukes), mustard, and ketchup. 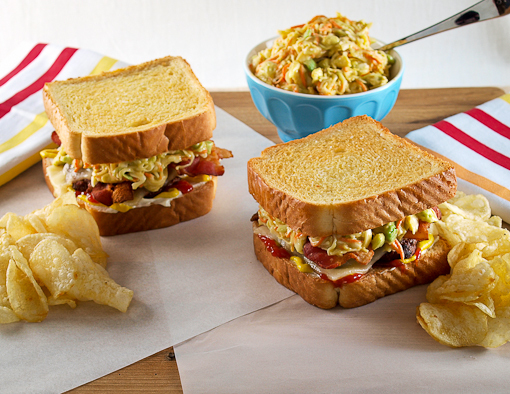 What is slightly unusual is the cool, creamy, and Ted-Mex inspired avocado slaw. I pureed an avocado into the slaw dressing to replace some of the mayonnaise and added a dash of earthy cumin and coriander. 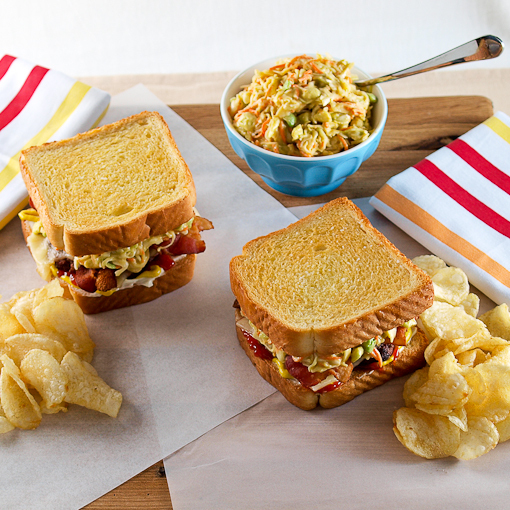 All this goodness is piled up on thick slices of Texas toast, lightly buttered and oven baked for maximum toastiness. This burger is bliss, even without the slaw, and I highly recommend it for your next party, dinner, or whenever you are craving a good, homemade burger! Begin by making the slaw. In a blender combine the mayonnaise, 1/2 of the avocado, sugar, lime juice, apple cider vinegar, salt, pepper, cumin, and coriander. Puree until completely smooth. 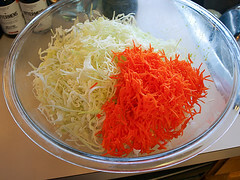 Pour the dressing into a large bowl and add the shredded cabbage and carrot. 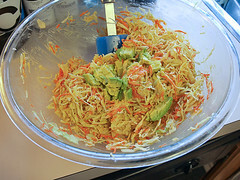 Toss to coat then add the remaining avocado, diced, into the slaw and mix gently. Chill for 1 hour. Now, prepare the burgers. Heat the oven to 350 F and heat the grill to medium heat. 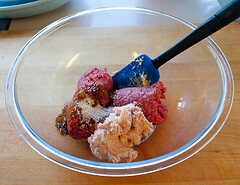 Place the ground beef, ground bacon, salt, paprika, and pepper into a medium bowl. 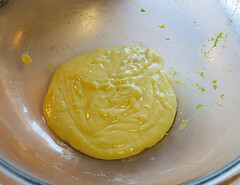 Mix gently until well combined, making sure not to squeeze or compress the meat. 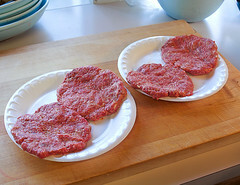 Form the meat into four patties that are 1/2 inch wider than the Texas Toast. Chill, uncovered, for 30 minutes. Once chilled cook the burgers on the heated grill until cooked all the way though, the internal temperature must reach 160 F. Remove from the grill, top with the cheese slices, and loosely tent with foil and rest for 5 minutes. 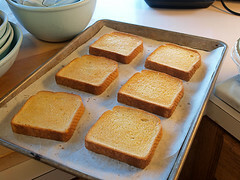 While the burgers rest prepare the Texas toast. 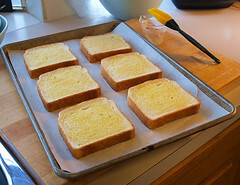 Brush one side of the bread with melted butter then place the toast in the heated oven for 5-10 minutes, or until the bread is lightly golden brown and toasted to your liking. To assemble place one slice of toast, buttered side down, and add the ketchup and mustard. 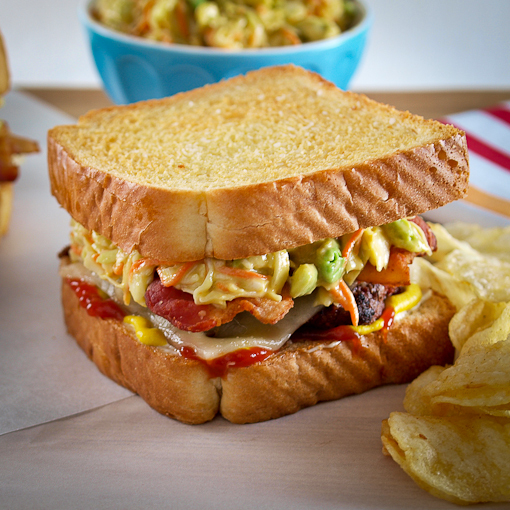 Lay down a burger patty, top with two slices of bacon and 1/4 cup of slaw. Brush the top slice of toast with mayonnaise and place on the burger. 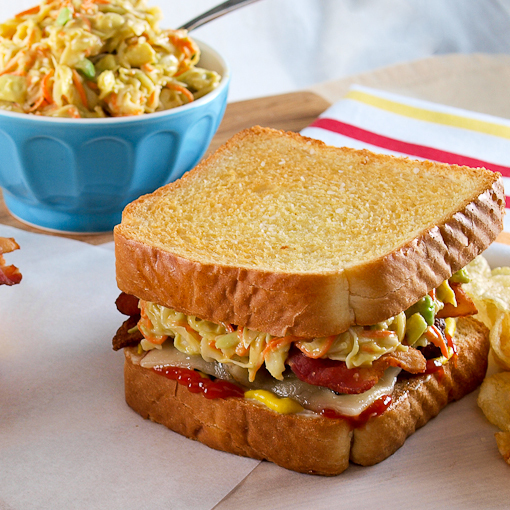 Enjoy with extra slaw on the side!